This week, I stumbled on this stunning bathroom design by LemonTree Interiors. Completely inspired by the modern simplicity, I knew right away the direction I wanted to take our master bathroom design. I have pulled together a few pieces that have inspired me and compiled them in a moodboard of sorts. But before we get to the pretty stuff, we have to kick up a bit more sheetrock dust. Get your safety glasses ready. 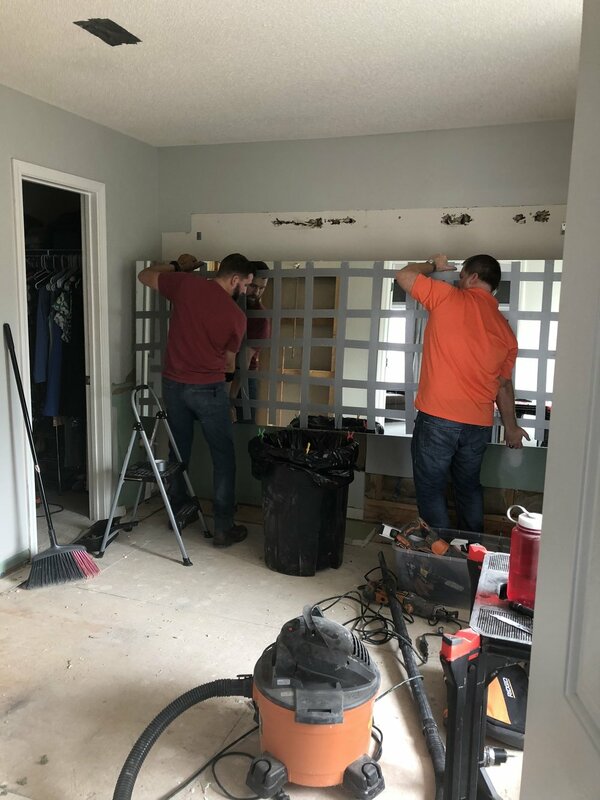 This weekend has been full of more bathroom renovation progress - John removed the right hand shower wall (since we are expanding the footprint of the shower). That enormous 10-foot long mirror is gone, too! John put duck tape on the glass in case it tried to break when removing it from the wall. And the tile and tub are just about gone! John and I have been working on compiling a bill of materials so that we can order everything for the new bathroom all at once - Lowes home delivery is SO convenient. The trickiest part of this whole renovation (we are realizing in real time) is that you really do have to have the end goal in mind and then sort of back into the project (for example we have to know exactly where the vanity will be so that we can set the plumbing in the wall and the electrical for both sides of the mirrors). Our vanity was delivered Tuesday morning of this week. The delivery guys wheeled it into our garage with a pallet jack and I told them that I wanted to inspect the vanity before they left (ALWAYS DO THIS). Lo and behold, it was damaged. Severely. So sorry I don't have photos to show you! It slipped my mind. The shipment box was not damaged. However, one of the undermounted sinks had completely broken away from the marble countertop and came crashing down in transit leaving the entire inside of the cabinet gouged and scraped up (not to mention the porcelain sink was badly chipped). The retailer offered to give me a discount to keep this vanity but it was just too damaged to be ok with. I refused the delivery and the retailer shipped a new vanity that same day! The morale of the story is to always check the condition of the item before the delivery guys leave it with you. Many retailers, unfortunately, will give you a really hard time about returning or exchanging a damaged product if you can't prove that you didn't break it, especially if the shipping box is not damaged upon delivery. Opening the package in front of the delivery guys is the best way to document if the product is in fact damaged or not. Crisis averted! Our new vanity should arrive in the next several days which will be really helpful to plan exactly where plumbing and electrical should go. In the meantime, I wanted to share with you my tentative moodboard for the bathroom. I'm so excited about how the initial plan is coming together! All product links are listed below. When you walk into the bathroom, you will see the double sink vanity first. 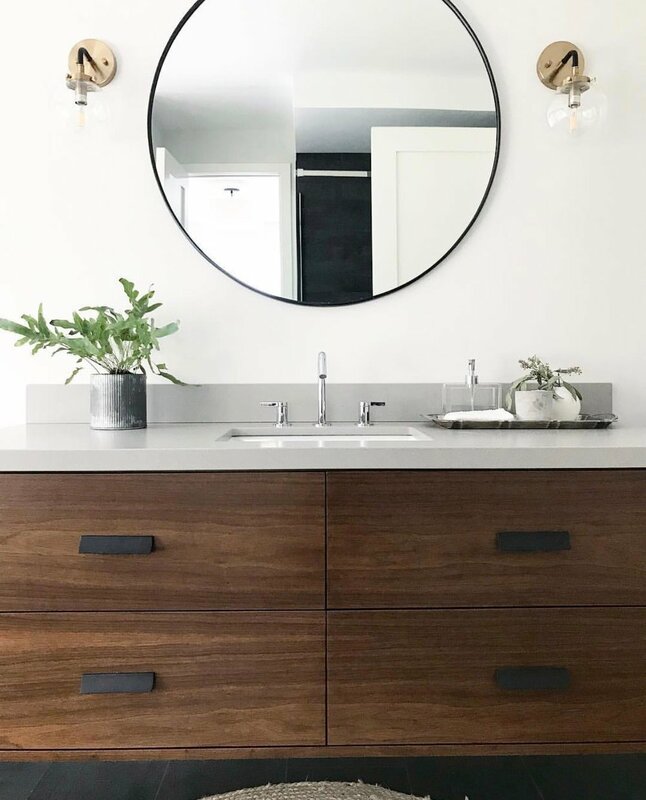 We will have two mirrors over each sink with good lighting on the outer sides of the two mirrors (maybe a sconce in between the two mirrors also... not sure yet). Since the vanity is 6-feet long, I want to go with one 6-foot long runner rather than 2 accent rugs. The new and improved (and larger) shower will have a built-in bench and a new glass door. We are still playing with the idea of installing two shower heads. Seems like an easy way to add another luxurious element to the master bathroom. The new tub insert will be bright white (the old tub was very off-white) so as not to clash with all the new tile and fresh trim paint. One thing I do know for certain is that we want to make this bathroom classic and traditional with some modern elements. I also want to try my hand at some mixed metals. I love how the mixed hardware finishes makes a room feel a bit more casual and less matchy-matchy. The trick is to pick a dominant metal - in our case, chrome - and then a supporting metal(s). I really wanted to incorporate the matte black because it is modern and masculine masculine. The curvature of the wall sconce mimics the curved edges of the mirror and the sink faucet and the warm tones in the brass sconce will tie in nicely with the rug. I cannot wait to see this room start to take shape! The finishing touches will come as we get closer to being done with this renovation. But for now, I think I have a pretty good grasp on the general direction of the design. What do you think of the design? 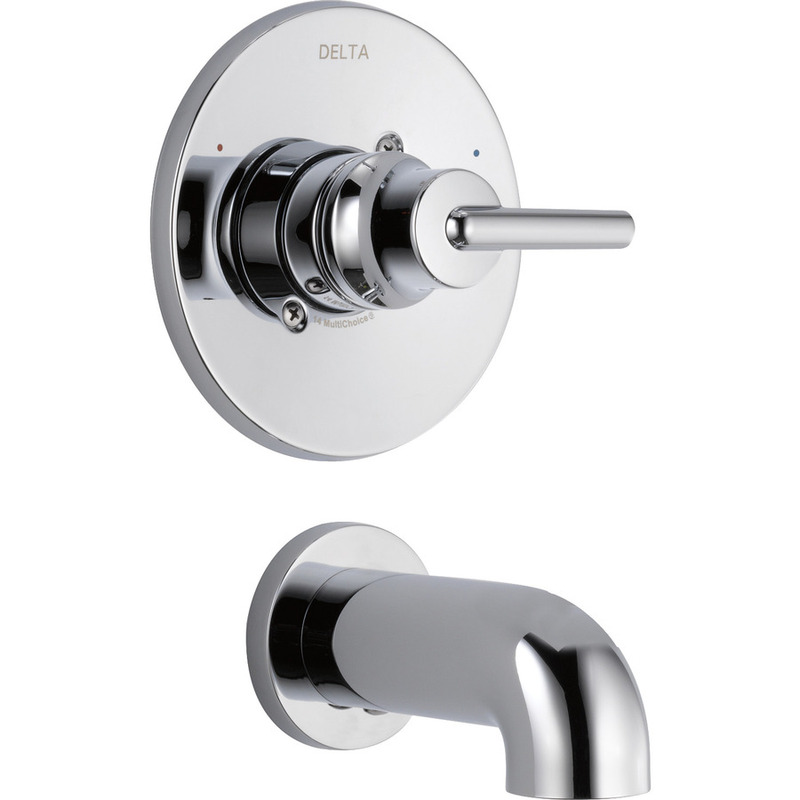 Should we consider installing two shower heads? We'd love for you to weigh in on the discussion! Leave a comment for us!